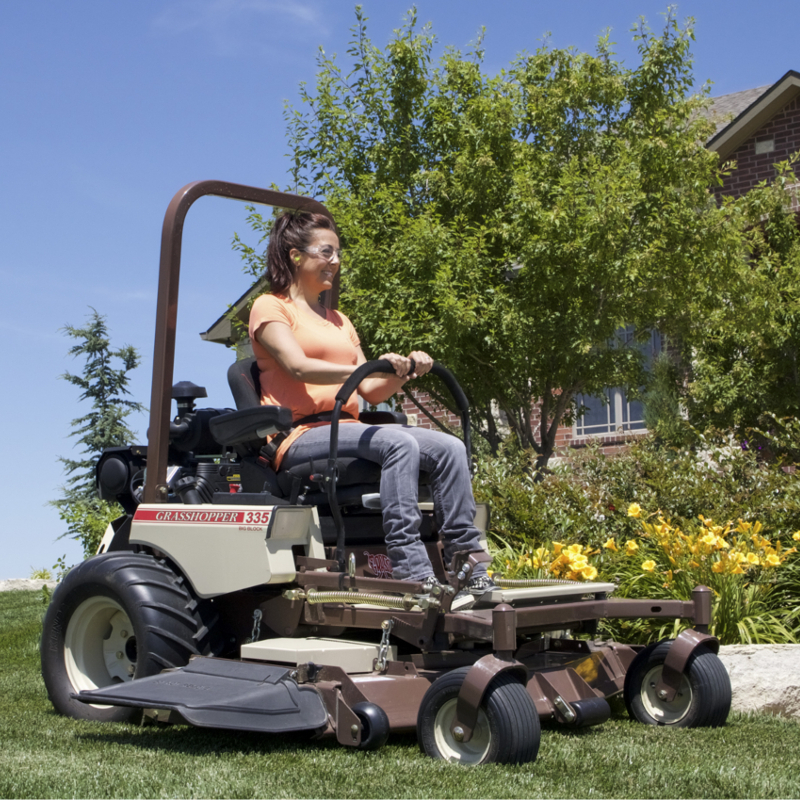 Power, efficiency, performance, durability and easy maintenance all define the Grasshopper Model 335 zero-turn ride-on lawn mower. 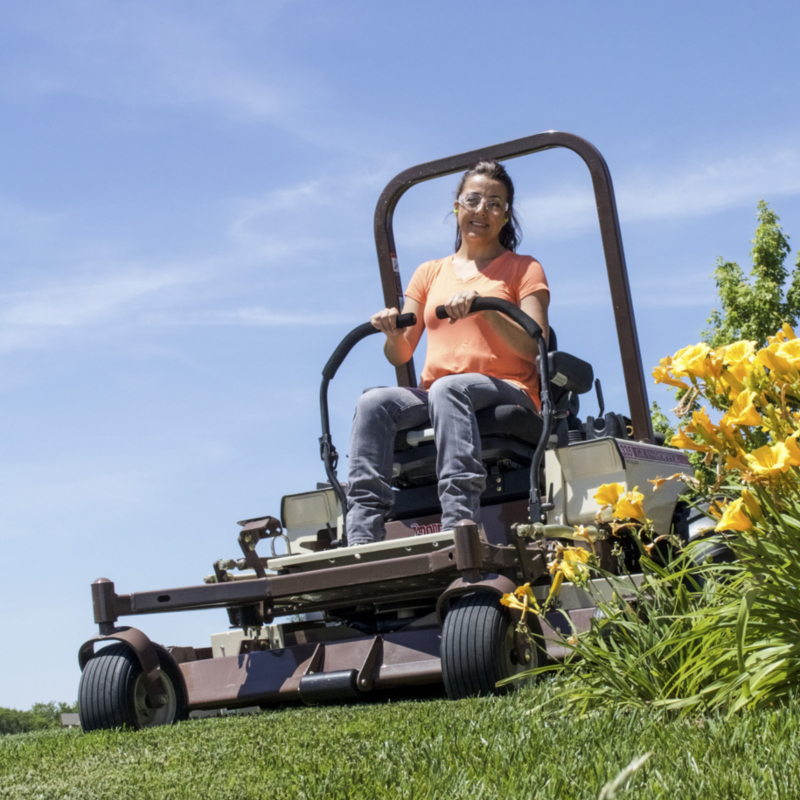 This mid-mount mower provides intense power to meet a professional landscaper’s demands in commercial mowing applications. Air Cleaner Heavy-duty, remote mounted, cyclonic, dual element air filtration. Heavy-duty, remote mounted, cyclonic, dual element air filtration. Muffler Ultra quiet, single, industrial type. Ultra quiet, single, industrial type. Deck Construction Double-layered 10-gauge plus 7-gauge formed-steel laminated spindle plane 0.313 in (7.95 mm) thick - more than 25% thicker than 0.25 in. (6.35 mm) with 7-gauge skirts for geometric strength. Spindle plane is 0.9 in. (22.86 mm) thick in stress zones. Anvil-edge design with 0.5 in. (12.7 mm) reinforcement on front edge of deck. Double-layered 10-gauge plus 7-gauge formed-steel laminated spindle plane 0.313 in (7.95 mm) thick - more than 25% thicker than 0.25 in. (6.35 mm) with 7-gauge skirts for geometric strength. Spindle plane is 0.9 in. (22.86 mm) thick in stress zones. Anvil-edge design with 0.5 in. (12.7 mm) reinforcement on front edge of deck. Deck Spindles Sentry™ Spindle System, 2.5 cm (approx. 1 in.) O.D. shaft. Double bearings greasable from top of deck. Spindle head designed to eliminate fiber wrap. Spindle cones shield housing and lower bearings from fiber wrap and dirt ingestion. Sentry™ Spindle System, 2.5 cm (approx. 1 in.) O.D. shaft. Double bearings greasable from top of deck. Spindle head designed to eliminate fiber wrap. Spindle cones shield housing and lower bearings from fiber wrap and dirt ingestion. Spindle Housing 8 in. (20.3 cm)-diameter housing. Machined aluminum housing on 61-inch deck. Cast iron on 72-inch deck. 8 in. (20.3 cm)-diameter housing. Machined aluminum housing on 61-inch deck. Cast iron on 72-inch deck. Blade Drive Belt drive with single Kevlar V-belt and idler arm tensioning. Belt drive with single Kevlar V-belt and idler arm tensioning. Interlock System Prevents engine start when PTO clutch is engaged or steering levers are in drive position. Allows operator dismount without engine shutdown only when PTO is disengaged and steering levers are locked in neutral. Prevents engine start when PTO clutch is engaged or steering levers are in drive position. Allows operator dismount without engine shutdown only when PTO is disengaged and steering levers are locked in neutral. Operator Seat Ultimate Suspension Ride (USR) iso-mounted, high-back, deep-cushioned, foam-padded, CoolTemp Cordura-covered, padded arms/backrest with lumbar support and coil-spring suspension. Optional CoolTemp Cordura-covered premier suspension seat. Ultimate Suspension Ride (USR) iso-mounted, high-back, deep-cushioned, foam-padded, CoolTemp Cordura-covered, padded arms/backrest with lumbar support and coil-spring suspension. Optional CoolTemp Cordura-covered premier suspension seat. Console-mounted Instruments Low engine oil pressure and parking brake warning lights, combination electronic fuel gauge/hour meter, ignition and push/pull PTO switches. Choke integrated with throttle lever. Low engine oil pressure and parking brake warning lights, combination electronic fuel gauge/hour meter, ignition and push/pull PTO switches. Choke integrated with throttle lever. Transmission Type Design-matched G2 hydrostatic system with auxillary cooling fans, HydroGear variable displacement 16 cc piston-type pumps and high-torque Parker wheel motors. Design-matched G2 hydrostatic system with auxillary cooling fans, HydroGear variable displacement 16 cc piston-type pumps and high-torque Parker wheel motors. Transmission Filtration 7 micron absolute, spin-on / Grasshopper CoolTemp Hydro-Max™ fluid withstands high and low temperature extremes for 1,000-hour change intervals. 7 micron absolute, spin-on / Grasshopper CoolTemp Hydro-Max™ fluid withstands high and low temperature extremes for 1,000-hour change intervals. Turning Radius True zero degree, turns within own length with counter-rotating, independently powered drive wheels. True zero degree, turns within own length with counter-rotating, independently powered drive wheels. Steering One- or two-hand operation with adjustable Hydra-Smooth™ dual levers that automatically return to neutral from either forward or reverse position. One- or two-hand operation with adjustable Hydra-Smooth™ dual levers that automatically return to neutral from either forward or reverse position. Brakes Dynamic braking through hydrostatic transmission. Dynamic braking through hydrostatic transmission. Parking Brake Disc parking brakes, one for each drive wheel. Disc parking brakes, one for each drive wheel. MidMount™ Front Caster Wheels 13x6.50x6; rib tread, pneumatic with greasable, double-sealed bearings to protect from grass wrap. 13x6.50x6; rib tread, pneumatic with greasable, double-sealed bearings to protect from grass wrap.